in 360i News with tags #mamming, #roastjoffrey, Best Large Agency, bravo, Erin Brady, Game of Thrones, GIFs, Giphy, HBO, Natasha Leggero, NeNe Leakes, oreo, oscar mayer, Say It With Bacon, Shorty Awards, Snack Hacks, Vine Both comments and trackbacks are closed. 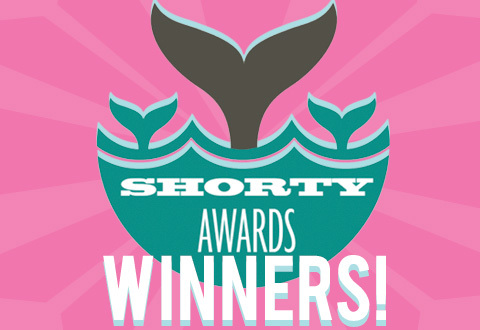 We’re excited to announce that 360i and our client partners have won three Shorty Awards. Among the accolades were top honors in the best “Best Large Agency” category, which 360i won for the second-straight year. 360i client Oreo was named a Best Brand on Vine (a new category this year) thanks to popular content such as the “Snack Hacks” how-to series and clever Halloween Vines that parodied iconic horror movies. Other finalists in this category included Samsung and Dunkin Donuts. Additionally, 360i and Oscar Mayer took home top honors in the “Best Use of Social for Food & Beverage” category for the brand’s “Say It With Bacon” campaign, a tongue-in-cheek effort that allowed people to gift luxe bacon gifts for Father’s Day. 360i earned finalist nods in three categories: Best Social Good Campaign (#Mamming), Best Use of Social Media for TV (HBO Game of Throne’s #ROASTJOFFREY) and Best Use of Animated GIFs (Bravo & GIPHY’s I Dream of NeNe: The Wedding). The Shorty Awards, now in its sixth year, honors “the best in social media” and has been dubbed “The Oscars of Social Media” by The New York Times. This year’s event featured host Natasha Leggero. Congratulations to all winners and finalists in this year’s Shorty Awards, and to the team at 360i and our clients for their ongoing partnership.